Take your choice of scents for a combination of one 4.3 - 4.6 oz bar of Goat's Milk Soap, a matching scented 4 oz. 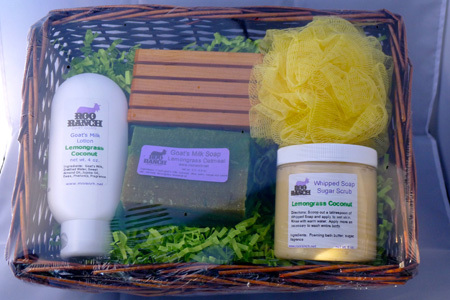 Goat's Milk Lotion and a matching 8 oz Whipped Sugar Soap Scrub. Included is a handcrafted pine soap dish and shower pouf. Packaged in a gift basket on a bed of colorful shredded paper and topped with a pretty ribbon.